Today is the last day to enter Head Over Heels for Teaching and Fourth Grade Flipper's amazing 1000 Followers New Year Celebration Giveaway! We have already given away ten days of prizes from our closest blogging buddies and our drawing at midnight EST tonight will have TWO Winners! The first winner will win a $50 Amazon gift card and the second winner will win a Classroom Friendly Pencil Sharpener in their choice of color! for creating this SUPER giveaway button! 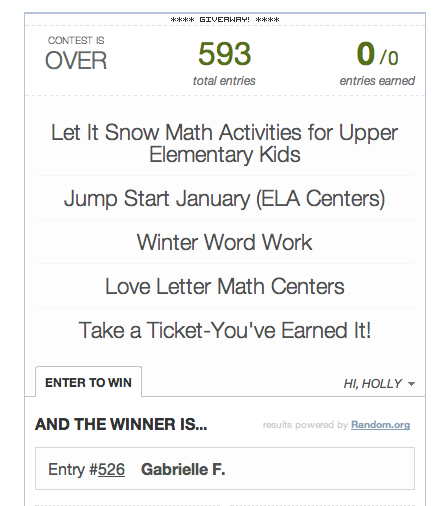 She won yesterday's Rafflecopter of products! We are so grateful for the friendships we’ve formed and the collaborative community to which we belong! Our blogging buddies are a wonderful support group that are always there for us! We also appreciate our readers, followers, your comments, TPT supporters, and FB fans-you motivate us to create and share new ideas! It’s such a wonderful feeling to share inspiration and passion with others. Now it's time to link up with my buddies for their Must Read Mentor Text party! 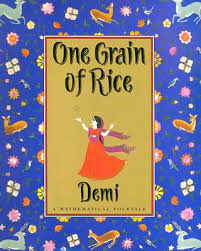 This week's focus is a math mentor text...I introduce to you One Grain of Rice. I originally found this book in our old reading series and it's definitely a MUST READ! If you don't have a copy of this book, don't worry! Just click here for a printable version or click here for a PowerPoint version! Long ago in India, there lived a raja who believed that he was wise and fair. But every year he kept nearly all of the people’s rice for himself. Then when famine came, the raja refused to share the rice, and the people went hungry. Then a village girl named Rani devises a clever plan. She does a good deed for the raja, and in return, the raja lets her choose her reward. Rani asks for just one grain of rice, doubled every day for thirty days. Through the surprising power of doubling, one grain of rice grows into more than one billion grains of rice — and Rani teaches the raja a lesson about what it truly means to be wise and fair. Pose a question to your students before reading, "Would you rather have $1,000 or one penny doubled for thirty days?" They always say $1,000! Then you can read the story or have them complete the chart to see how quickly the numbers grow before reading the text. Here's a chart/worksheet from NCTM.org to complete with the story. The numbers get very large, so if you teach a primary grade you could demonstrate or allow them to use calculators. Not only is the story wonderful literature, it has a great moral, and is perfect to tie into math! Check out Collaboration Cuties for so many great reads! Thank you for this awesome giveaway! I appreciate all of your great ideas, wonderful products, and motivational words. Have a great week! Thanks for such a fun giveaway this week. We have this story in the 3rd grade reading series as well! I loved reading it because they were always so surprised how doubling can add up! It's great for math talk! And, thanks for the amazing giveaway and for being such a great blogging buddy who is so positive and supportive! I'm so glad to have gotten to get to know you!! One Grain of Rice is an amazing story. Congrats on achieving so many followers! Your blog is amazing! This text looks wonderful--have never used it... Thanks for sharing the printable and PowerPoint versions! My New Years Resolution / Life Resolution would be to eat in moderation. I used a similar book by the same name for another link up earlier last year. You might want to check it out http://teachingisagift.blogspot.ca/2013/07/math-must-read-mentor-texts.html. Hope you are doing well and congrats again! My resolution is to lose weight.....again. Oh my gosh, friend. You have got to be looking forward to tomorrow and having these 10 days of craziness OVER! Such an awesome giveaway experience! Glad I could be a part of it!! This is a book that I always look at and have never picked up to actually read - shame on me - so thanks for sharing the links. Congratulations again on your milestone and thanks for organizing such an amazing giveaway. Spark Student Motivation-Read to Win! My Day in High Heels! Day 2 Giveaway and a FB Fan Freebie! 1,000 Followers New Year Celebration Giveaway!